A wonderful all in 1 product. You'll wonder how you managed without it. 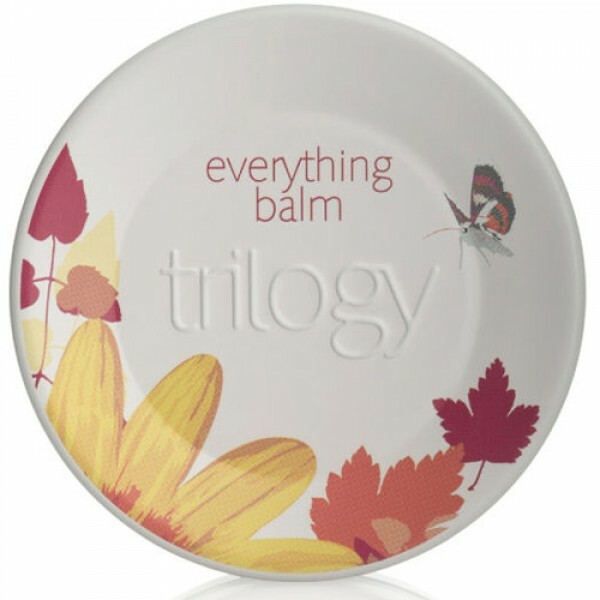 Trilogy have found what they believe to be the most beneficial, most sustainable and wherever possible, certified organic advanced natural ingredients in the world to make their wonderful Everything Balm. Together these blend into a concentrated, healing, slight in natural fragrance balm rich in Omega 3 and 6, natural super-emollients, vitamins and antioxidants. All these ingredients have proven and potent skin conditioning and healing properties. Octyl Palmitate, Bees (Cera Alba) Wax, Sclerocarya Birrea (Marula) seed oil, Olea Europaea (Olive Oil), Buxus Chinesis (Rose Hip) Seed Oil, Oenothera Biennis (Evening Primrose) Seed Oil, Simmondsia Chinensis (Jojoba) Seed, Tocopherol (Vitamin E), Triticum Vulgare (Wheat) Germ oil, Miel (Honey), Parfum, Citral*, D-imonene*, Citronellol*, Courmarine*, Geraniol*, Linalool*, *Components of Natural essential oils of Lavender, Frankincense and Rose Geranium, Preservative Free. Apply as often as you like, massage in well and remember that a little goes a long way.